I love cooking challenges, so I was completely floored to be asked to participate in the Go 4 Gourmet cooking challenge with McCormick Gourmet this month! 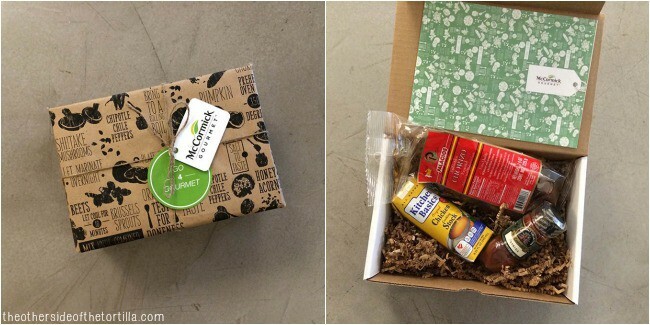 The rules were simple: They’d ship me a box of ingredients and I would create a dish that included all the ingredients. Maybe I’ve been watching too many episodes of “Chopped,” but I couldn’t wait to get into the kitchen and create something. As soon as I found out the ingredients in the box would be paprika, chorizo and chicken stock and the requirement that I needed to also add fresh Brussels sprouts, I knew exactly what to make: A paella! Spanish influences in Mexican cuisine mean it’s not out of the ordinary to see different kinds of paella served in Mexico. This is a sponsored post and I received some of the ingredients from McCormick and was compensated for my time and talent to develop this recipe. 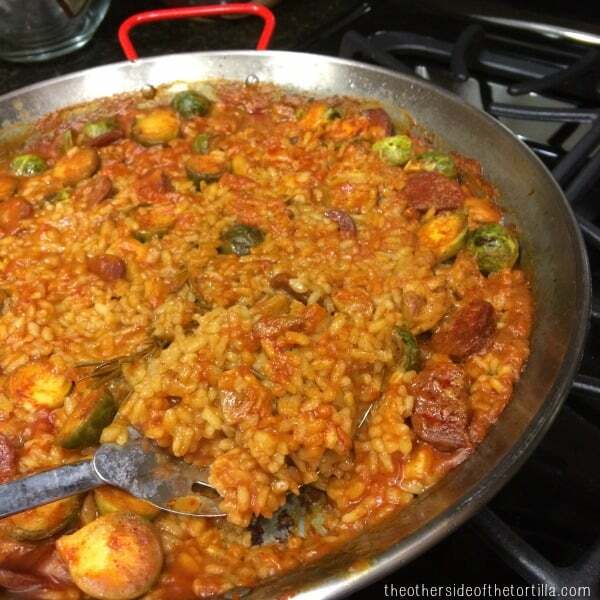 I’ve written about eating paella in Mexico and shared my own paella recipe here before, along with tips for making paella (from the pan to the correct rice to use, and how to steep saffron). 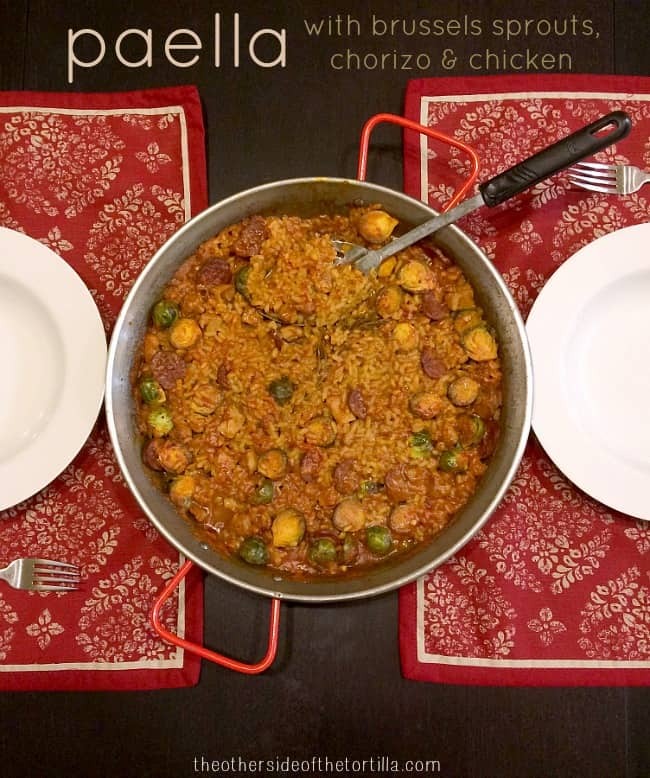 Although one might not think of Brussels sprouts in a paella, this recipe is a riff off of a classic paella Valenciana that has rabbit and artichokes and I replaced the rabbit with chicken thighs (just because chicken is easier to find) and substituted Brussels sprouts for the artichokes. The earthy flavor of Brussels sprouts and spicy, salty chorizo is a perfect flavor combination as well. I knew I wanted the Brussels sprouts to retain a little crispness, so I decided to roast them with a little olive oil, paprika and kosher salt before putting them into the paella. The result: Brussels sprouts that still had a bite despite being submersed in chicken broth and rice. The chorizo also provides enough salt that aside from the kosher salt you’ll use to roast the Brussels sprouts, you likely won’t feel the need to cook with more salt. You can participate in this and other Go 4 Gourmet challenges at Go4Gourmet.McCormick.com! New challenges are announced every two weeks through December and you can enter your own recipes to win weekly prizes! Earthy Brussels sprouts, spicy and salty chorizo, and chicken thighs are an excellent flavor melding for a spin on a classic paella Valenciana. This is a sponsored recipe for the Go4Gourmet challenge with McCormick Gourmet. Clean and halve 5 ounces of baby brussel sprouts. In a bowl, add brussel sprouts, 2 tablespoons olive oil, 1/2 teaspoon McCormick’s paprika and 1/4 teaspoon kosher salt. Toss until coated. 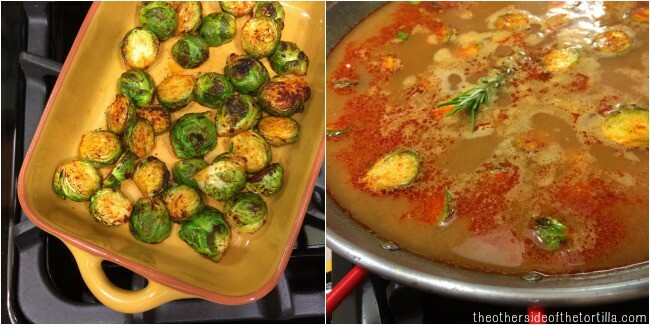 In a shallow casserole dish, spread brussel sprouts out and cook under your broiler for about 5 minutes or until the brussel sprouts start to brown and crisp. Remove from the broiler and set aside. While the brussel sprouts are under the broiler, steep your saffron in a small dish with 1 1/2 tablespoons of hot water. Set aside. In your paella pan, heat the olive oil over medium heat and sear the chicken until it browns a bit. Sprinkle the paprika over the chicken. Pour the tomato puree around the edge of the pan all the way around. Let it cook for a minute or two. Add the rice and chicken stock; stir gently until the rice is completely moist. Add the saffron and the little bit of water that you steeped it in. Stir gently. Add roasted brussel sprouts to the pan, tucking them into the rice and chicken stock. The brussel sprouts should be mostly covered. Allow it to cook for a few minutes until you see the rice rise, then tuck the sprig of rosemary into the rice. Continue cooking until the rice is soft and you can hear the socarrat forming along the bottom of the pan. You’ll know the socarrat is forming when you hear a little crackling noise. (Socarrat is the yummy, crunchy sort of caramelized rice that sticks to the bottom and is the prize of the paella party.) Don’t be discouraged if you aren’t able to achieve socarrat perfection on your first try; it takes some practice to get it right. Be sure to use baby Brussels sprouts and hard, cured Spanish chorizo.